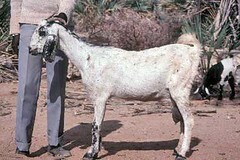 Tall (68–74 cm), predominantly white in colour; hairy thighs and long pendulous ears (FARM-AFRICA, 1996). Confined to the west and southwest of Eritrean lowlands and the adjoining areas in northern Ethiopia (FARM-Africa, 1996). Derived from the Nubian family of goats (FARM-Africa).